Nearly every triathlete these days from sprint triathlons through to Ironman have time trial bikes and I would guess half of them are not taking the full advantage of being aerodynamic. The back half of a 70.3 and a Ironman, I guess one third of the field are sitting up causing their bike split to be longer.You have to make that aero position your default position. It is simple maths. Every minute you are out of the aero position, it is costing you time. At first it can be difficult to stay in this position for long periods of time. Sore back and neck can quickly appear as your body isn’t use to this position. It takes time and often mental strength to be able to spend hours on end in this position. Before you get started, you need to get a bike fit from someone who knows and understand triathlons. A lot of bike shop staff understand pro cycling but not triathlon. The positions are different. If you haven’t had a bike fit in the past couple of years, it may be worth getting check again. 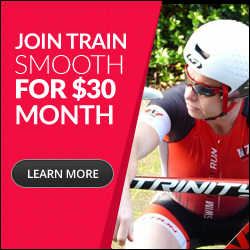 Best bet is to contact your local triathlon club and ask for recommendations. Once you know you have the best position for you, it is time to live in this position. Spend as much time in the aero position as possible. When your neck and back become sore, sit up 30sec every two minutes and get back into it again. The goal is to stay relaxed at all times. The athletes who can spend hours in the tri bars are the ones who with really relaxed upper body’s. Start the ride with the aim of spending 90% of the ride in the aero position. Learn to drink, learn to get things in and out of your rear pocket and if your bike skills are capable, apply sun screen in this position. This is also a good session to test nutrition. Can your body handle the nutrition in this position? Test, test and test again. It is important to look in front of you when on the indoor trainers. You need to ride as if you are on the road. It has been seen at some professional races that athletes who do the majority of their riding indoors have crashed as they spent too long with their head looking at their front wheel. This was their default position.